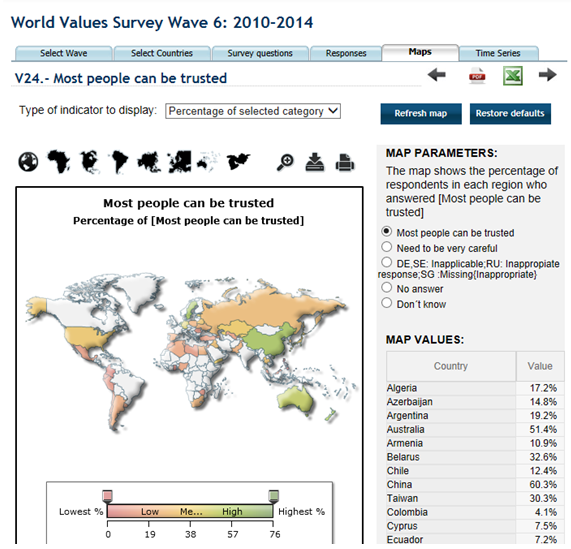 Documentation of the World Values Survey has been completely reorganized and revised. Documentation for download consisting of data files and pdf documents with results, questionnaires or technical/methodological description. Results from the different waves that can be analyzed online using a simple interface. The new MAP feature not only gives a different view of results but allows you to get indicators useful to build rankings. Maps are displayed for indicators built for each variable. We have defined an indicator for each variable of the different waves. Maps and their data can be exported to Excel of PDF. For any variable you can quickly compare the existing time series for selected countries. Select the countries to compare in a given wave, select the variable and then click the series Tab and you will get the available time series for all waves (when the variable has been replicated). Time series can be also be seen in graphical way and exported to PDF or Excel. All waves have been related internally and made compatible at the Data Archive in order to make this feature possible. 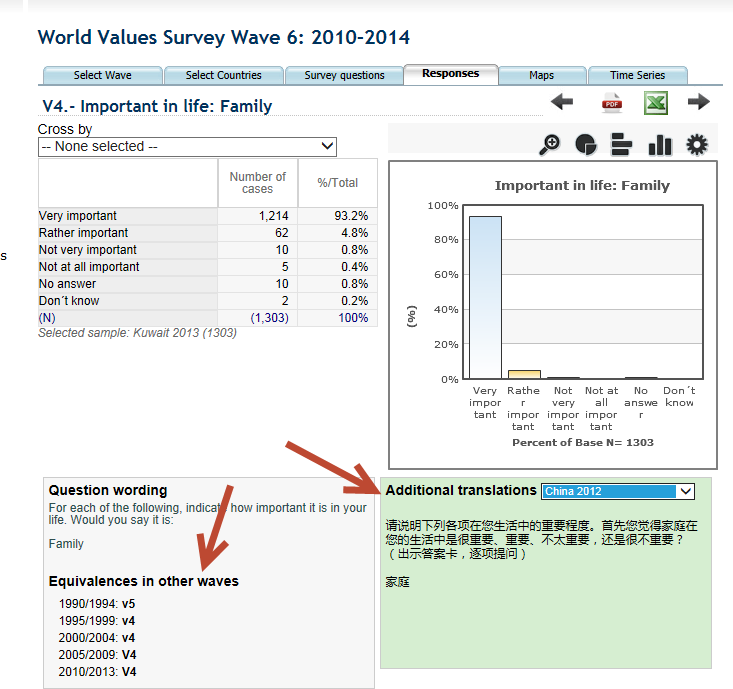 Questions can now be seen in all applied questionnaire's languages (provided they are available). You only need to select the samle in a dropdown list. While the translations appear on the right side of the question screen, the equivalences of the variable and the question wording appear on the left. When using the WVS data, please, make sure that you included a proper citation/ reference to the WVSA data-base as listed below. WVS data brought to you in free access is the result of work of a great number of scholars and survey researchers, and we believe their efforts should be acknowledged. Inglehart, R., C. Haerpfer, A. Moreno, C. Welzel, K. Kizilova, J. Diez-Medrano, M. Lagos, P. Norris, E. Ponarin & B. Puranen et al. (eds.). 2014. World Values Survey: Round Six - Country-Pooled Datafile Version: http://www.worldvaluessurvey.org/WVSDocumentationWV6.jsp. Madrid: JD Systems Institute. Inglehart, R., C. Haerpfer, A. Moreno, C. Welzel, K. Kizilova, J. Diez-Medrano, M. Lagos, P. Norris, E. Ponarin & B. Puranen et al. (eds.). 2014. 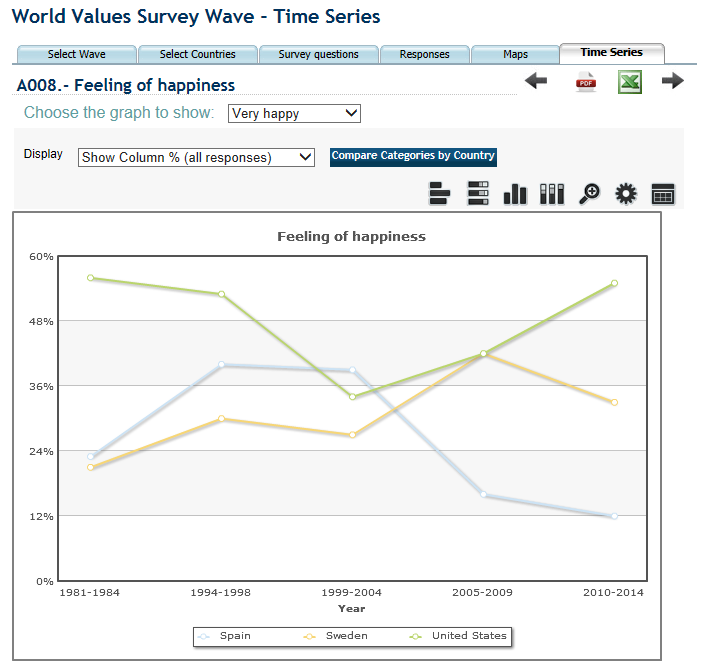 World Values Survey: All Rounds - Country-Pooled Datafile Version: http://www.worldvaluessurvey.org/WVSDocumentationWVL.jsp. Madrid: JD Systems Institute.